I've always thought this was a weird dish, pork wrapped around melon. But it tastes really good, the salty prosciutto against a sweet, juicy piece of melon. I don't like to order this in a restaurant because you can never be sure how good the melon will be, sometimes even in the nicest places!! 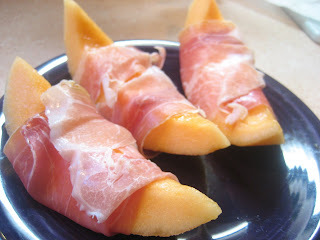 But when I start to get good musk melons and cantaloupe from the market, I like to pick up some prosciutto de Parma and make this at home. Oh, yes! Such a freakishly good combo. I'm glad you reminded me of it. Melons will soon be around our market. I've actually been buying melons billed as "Tuscan cantaloupes" at the grocery store, and they have been surprisingly good -- sweet and juicy.